Patra's Other Place: Christmas at our place. A lot of bloggers are posting lovely photos of their house decorations, so I decided to do the same. We don't have a tree or anything really big - just put a few bits and pieces around the house to make it festive. Below is the ceramic Nativity set that I found at our opshop two years ago. This is in the entrance hall as you walk in the front door. 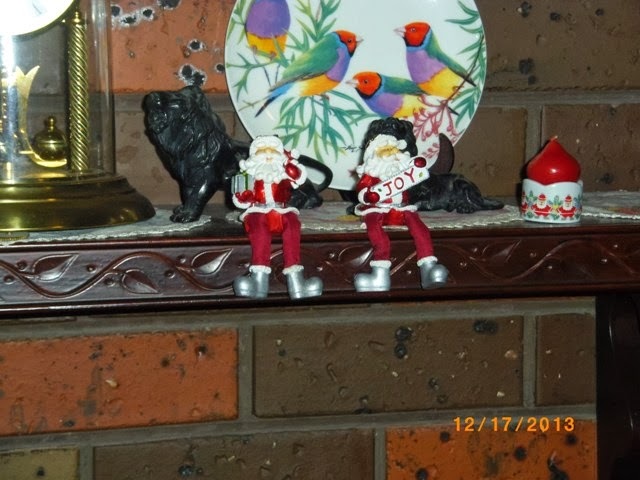 Santa Claus dangling his legs over the mantelpiece on the left. The NOEL letters are in the form of a sleigh, pulled by an elf, with a candle in each letter. 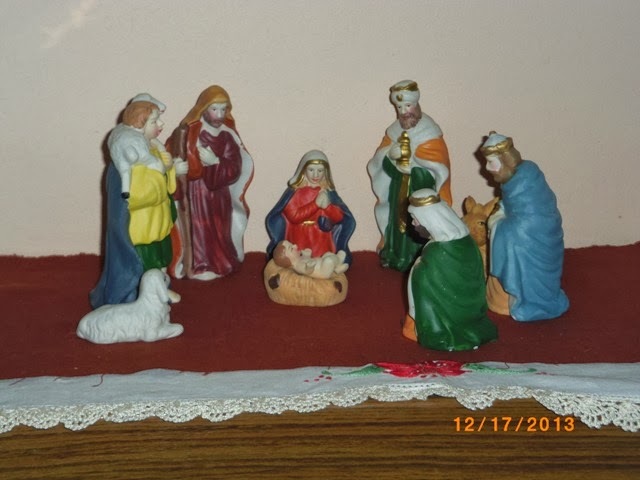 I've had this little set for so many years I can't remember where it came from, but it was sent from a penpal overseas somewhere, I know that much. 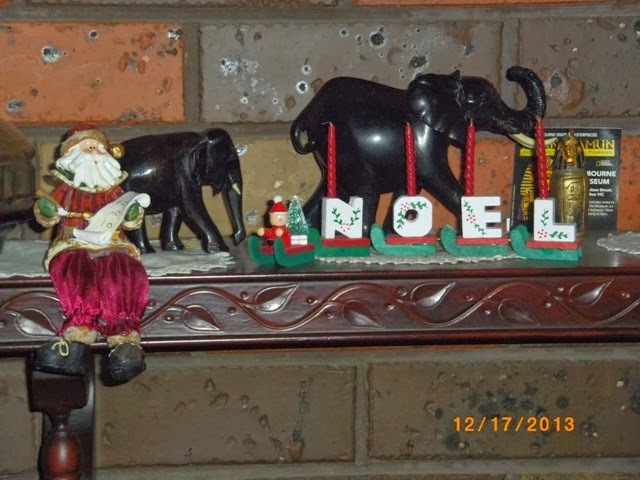 The black stone elephants are on the shelf all the time - not part of the Christmas decor! At the other end of the mantel shelf are two more little Santa Claus figures dangling their legs, with a little candle. (Again, the plate with the Gouldian Finches is a permanent resident on the shelf). I put a NOEL patchwork mat on this telephone table in the hall, then Ken decided to put a battery powered light-up Santa Claus on top of it, but that's okay because it looks lovely when it is all lit up like this. 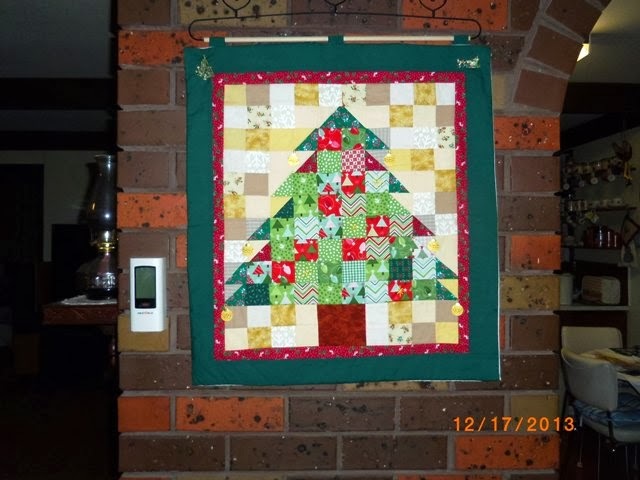 A wall hanging that I made last year. 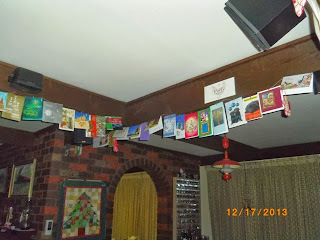 We hang our Christmas cards up on the beams, because if they are just sitting around on the table and other furniture, they get blown around by the air conditioner or if the front door is opened on a windy day. 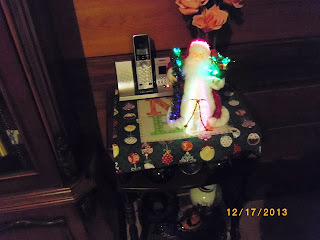 We also have a plastic "Merry Christmas" sign on the front door, and flashing lights in the front windows, but they don't photograph well, so I haven't tried to post pics here. Some of our neighbours have spectacular lighting displays in their front yards this year, and I did try to photograph them, but the photos just turned out a big blur, which is a shame.